Expand the bounds of your creativity and dedication to crafts with the Vinyl Starter Kit from silhouette. This kit contains all the materials you need to get started, from adhesive vinyl in a variety of colors to an instructional DVD. Box Dimensions (LxWxH) 11.7 x 9.0 x 2.3"
Vinyl Starter Kit is rated 4.0 out of 5 by 2. Rated 4 out of 5 by Pete from Amazing package I initially brought the wrong kit hoping it was the heat transfer kit . Upon realizing my mistake I found the vinyl kit extremely lucrative for my business. Thanks B&H for delivering another great product. 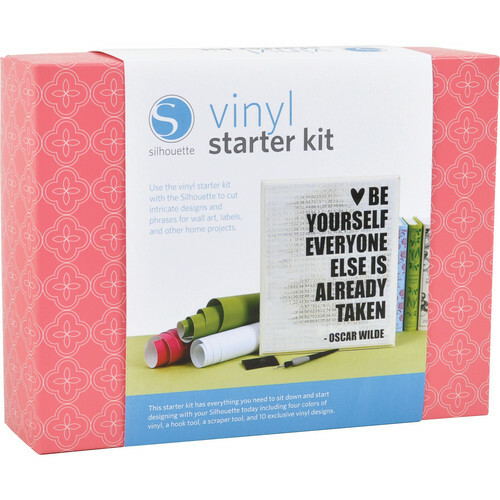 Rated 4 out of 5 by Kevin from Good starter pack Nice pack of vinyl sheets for crafting projects.